Jp. = Fudō Myō-ō, Ch. = Bùdòng Míngwáng. 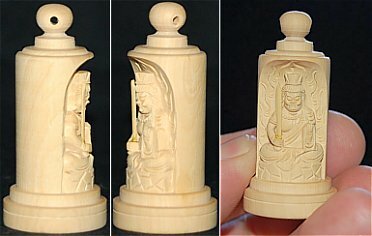 Wonderful and intricate carving of Fudo with protective cap. The top of the statue has a small hole, allowing you to insert a string or other cord to connect the piece to your cell phone, car mirror, or anything you like. Wields devil-subduing sword in right hand (also symbolizes wisdom cutting through ignorance); holds lasso in left to bind up the wicked (or keep people from straying); sitting atop a rock because Fudo's faith is "immovable." Flaming halo symbolizes the burning away of desires. See Fudo background notes for more details on iconography. Size of Mini-Tower when closed. The deity shown here is not Fudo. 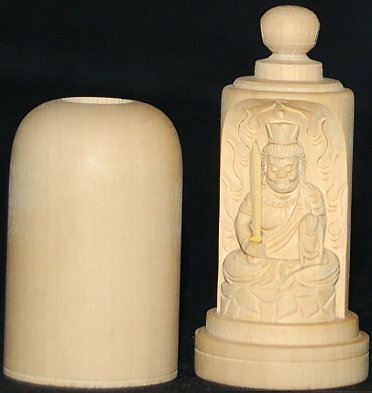 But Fudo piece is the exact same design and size.